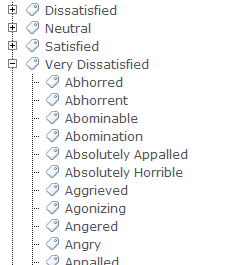 The WAND Sentiment Taxonomy contains 966 sentiment terms organized from Very Dissatisfied, Dissatisfied, Neutral, Satisfied, and Very Satisfied. This taxonomy was specifically designed to help power sentiment analysis engines to understand the tone of text content such as reviews. It includes an extensive set of adjectives, adverbs, profanity, and more pulled from real world reviews of products and services and other text on the internet. We've previously discussed this taxonomy on this blog a few years ago, but wanted to share a screenshot in today's post.